Scaffolding is now going up around the Chancel. The first major job to be undertaken will be the removal of the Nave East End Coping Stones to be reseated when Lead Flashing has been fitted. 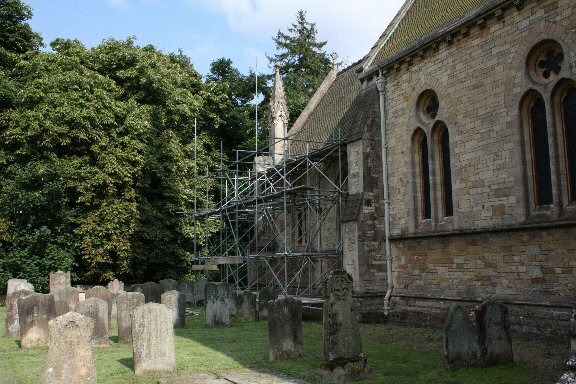 This will be done prior to the chancel roof to stop debris falling on the new roof. Hirst Consrvation have spent today completing a detailed pphotographic condition survey of the Chancel ceiling prior to external works commencing. Their task in the project is to clean and repair the chancel ceiling along with the repair of the North Chancel wall. Having been up the scaffolding today I really dont envy the working environment they will have to suffer. Blog Updated with Summer Information. This months Message, Magazine and Service times have now been uploaded. There will be no paper magazine during August, the next issue will be mid-September. My copy cut off date for the September issue will be Sept 10th. Please start thinking what you could submit, photos, articles etc. A lot goes on in Nocton, it's good we all know about it! Church in the Village Hall. Last Sunday saw us transfer to the Village Hall for our fortnightly service of Holy Communion, here in Nocton. It was a great success. I'm sure the singing was much improved from that we normally hear in church!! We will continue the services in the village hall untill the church is fully reopened. The target date for completion is the end of January 2012. Today is the 200th anniversary of the birth of Sir George Gilbert Scott. 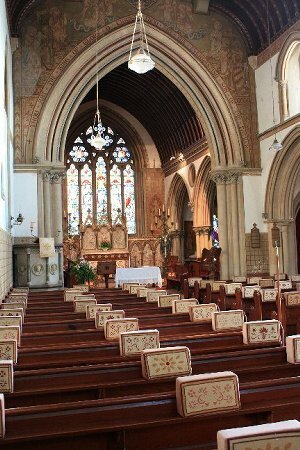 Glibert Scott was the architect employed by Lady Ripon to design All Saints Church in Nocton, as a 'fitting memorial' to her late husband Frederick Robinson, 1st Earl of Ripon. Gilbert Scott built in a style called Gothic Revival, which was extremely popular mid 19th century as the Victorians looked back to the 11th and 12th centuries, a period they regarded as creating buildings of the finest quality. Repairs are now well underway to our Gothic Revival church which also has a major birthday (150 years) next years. Another big thanks, this time to the Lincolnshire Churches Trust and its secretary, Des Underwood. I applied for a grant from them to make up some of the shortfall on the roof. Des and I toured the church a couple of weeks ago, and on the 28th June their grants committee awarded us another £5000 to toward our reroofing project. It is very much appreciated. We are very much in the final stages of fund raising and are around £8,000 short now. Occasionally something unexpected comes up, this time it's our insurance premium for the church which has increased by £1339.86!!!!! to cover the period the builders are at work. Emptied & Closed ....but the business of God still goes on! After a busy weekend of a wedding on Saturday and a baptism today the church has finally beem closed for the roof repairs. Thanks to the huge team who helped empty and pack away and move key things to the village hall so our worship can continue. The church looks very sad and forlorn as we left it but with the builders taking over tomorrow we are already looking forward to the repairs and our re-occupation early next year. As for now our services continue unchanged, now taking place in the village hall, on the normal sundays at the normal times, we look forward to seeing you.